QUESTION: If you don't have fresh lemons, can you use the bottled lemon juice? ANSWER: Yes, of course you can use the bottled lemon juice, but you will not get the same degree of benefits as from fresh lemons. Several years ago in our local market, I came across a glass bottle of "Organic Lemon Juice" (not from a concentrate). 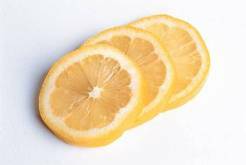 I thought I had found a gold mine because I had wanted to drink more lemon juice but had not yet developed a good habit of squeezing fresh lemons daily. The juice tasted great, just like fresh-squeezed lemon juice. But . . . not the same results. After a while I could tell it just wasn't providing the same benefits. I also believe now that the most important benefits of lemons come from their enzymatic properties. When lemons, or any type of produce for that matter, is processed, packaged, and stored for any length of time, the enzymatic properties are significantly diminished. In fact, the enzymes may not be active at all in bottled lemon juice. The other factor is that processing often changes the molecular structure of foods! Remember, fresh-squeezed lemon juice is similar in atomic structure to saliva, hydrochloric acid, bile and the stomach’s other digestive juices. This is one of the main reasons it is so beneficial to digestion and elimination, as well as enhancing nutrient utilization from the food we eat. If I had to guess, I would say most bottled lemon juice (including organic) has less than 25 percent of the health benefits of fresh lemon juice. Also, if you do drink bottled lemon juice, I would only buy it in glass bottles, not plastic since the citric acid could deteriorate the plastic, leeching chemicals into the juice. From the health standpoint, squeezing fresh lemons is definitely worth the time, cost, and slight inconvenience of squeezing them. I was buying a bag of lemons to use in my lemon water, but as I would get down to the end of the bag, many of the lemons would have gone bad. I now buy a bag of lemons and squeeze the whole bag and pour the lemon juice into ice cube trays. I then take out a fresh lemon ice cube for fresh lemon juice daily.